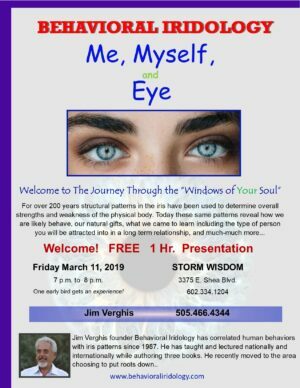 Find out the truth about how your eyes reveal your personality and many of your parts that make you the way you are. By following the steps below, you will learn how to get decent images of your own eyes and their meanings. You be the judge, only you know what is true! Follow the steps below, and have a great time doing it. Call a few friends over for an “eye know you” party, who knows what may happen. 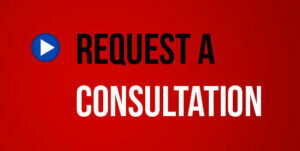 Professional Photographer – most will use a macro lens 80-105mm and a ring or similar flash. Now that you have your iris pictures, you can view them separately or make a 2-up (see below), putting both iris’s together. Open Photoshop or Elements. This sequence works with slight variations with other picture editing programs too. 3). 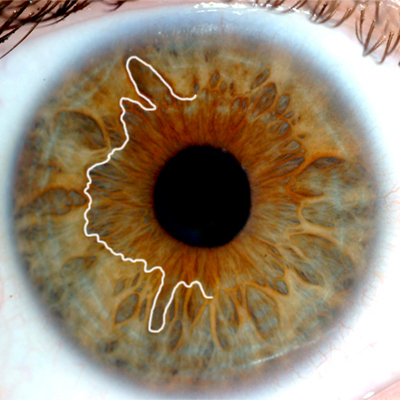 Click Image – Crop – adjust borders to about ½ – ¼ inch from edge of colored portion of iris. Hit Enter key. 4). Click Image – Resize – Canvas Size – double the width, round up. If your image is 11.34 make it 23. Now position the image to enlarge the canvas. Go to Anchor: Using a right eye move the image to the left. Using a left eye move the image to the right. Click Enter key. 6). Click Image – Crop – repeat step 4 to crop. 7). With cropped image, simply highlight and copy image. Hit Ctrl. A – then Ctrl. C.
8). Open resized canvas – Hit Ctrl. V This will paste the image on the canvas. 9). Click Move Tool (v) position second image. You can re-crop entire image if needed. 11). Congratulations! Now it is time to meet your eyes and you like never before! Go to How to Interpret My Eyes. 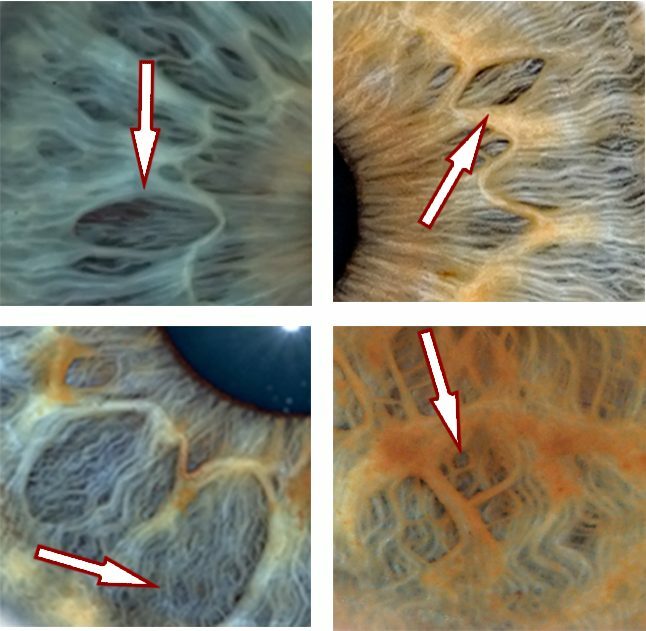 What to Look For: the most common structural iris component is Neurogenic Fibers. They are the while lines emanating from the pupil like spokes on a wheel. Just ignore them for now. Psora and Lacunae are the two structural components that define personality type. This is what Psora and Lacunae look like.. Below are examples of both. 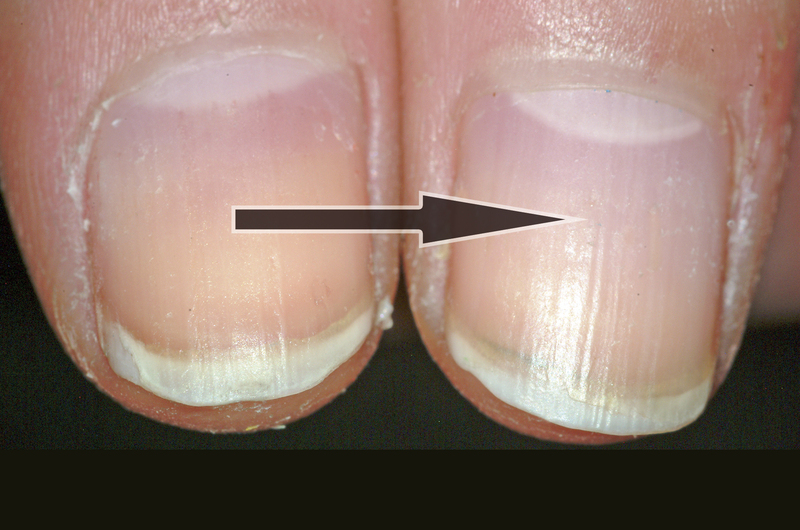 Lacunae Rounded or openings are the second structural component that determine your personality type. They vary in shape and size note their differences. 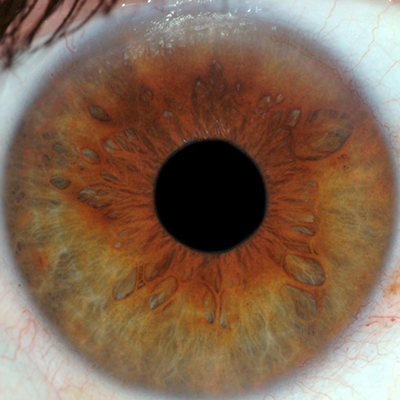 Just remember the psora and lacunae for now, we will add in one more thing then use your color to find your iris type. The next step in your selfie evaluation is to see one of the key ways you process information and life itself. Are you more introverted or extroverted? For this, we will use the Autonomic Nerve Ring. Introversion and Extroversion are determined by the distance the Ring is from the pupil. The further from the pupil the more extroverted the personality, closer to the pupil increases introversion. These are the primary effects of extroversion and introversion. Introversion and extroversion are determined at the core level by the distance the Autonomic Nerve Wreath is from the pupil. The further away from the pupil the more extroverted, the closer increases introversion. To determine your iris color look at the overall colors especially to the edge of your iris where it meets the sclera, (the white portion of the eye). Originally or long-ago iris color was associated with geographic location by latitude. Peoples inhabiting around the equator and just a bit north were home to brown eye people. Going north into Europe the eyes became green, and still further north became blue in the Scandinavian countries. 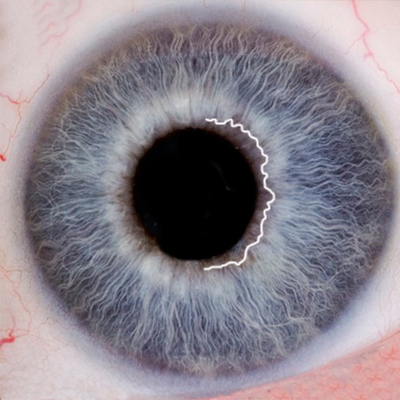 Due to travel and interbreeding, the purity of the associated tendencies of eyes color have been diluted and hybrid. Ingenious peoples (brown) who are naturally grounded and practical, community, tribal oriented have integrated into western culture technology and the rest of the world and so on. We are one world today a melting pot of inter-continental breeding and hybriding. Hence color plays a less significant role in personality and behavior interpretation but serves a great role in initiating the process of determining your own iris type. Color is the easiest to read so let’s start there. Blues eyes are easy, however, they may develop rust colors, gain greenish tones, or become whiter, but usually not to excessive. There are many shades of green and darker rust, to brown pigments that form more towards the surface and can cover a significant portion of the eye. Over half the world’s population has brown eyes. There are even more shades of brown, from light to almost black. 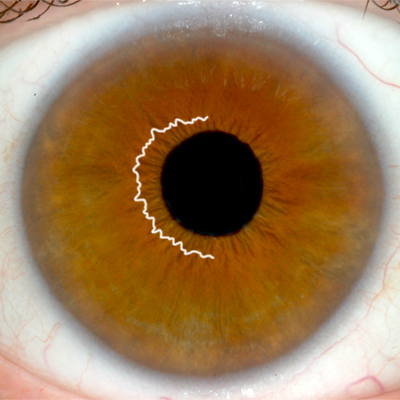 The true brown or hematogenic eye can be light to very dark almost black in appearance, virtually “impossible” to see the structure. Fortunately, with digital images use any picture editing program where you can adjust the brightness and contrast. By increasing the brightness and contrast the structure we are looking for will be become visible. ALL THE BROWN EYES HAVE BEEN DIGITALLY ALTERED FOR VIEWING PURPOSES ONLY. 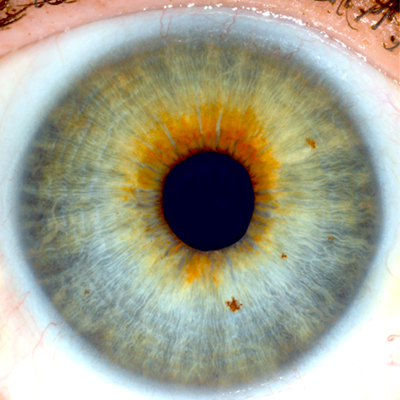 If you have deep Lacunae they may appear an off-white color, this is only flash reflection, not actual iris color. 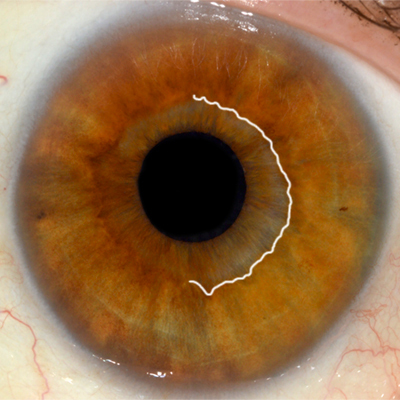 The exception is a white ring at the periphery of the eye where it meets the white or sclera, this is very common in the brown eye. Now Click on your iris color from there you can determine your primary personality type. After reading and or listening to the interpretation of your eyes you found some things to be totally opposite or not right of how you actually are these next modifiers will help to explain why. You could just be very strange in which case I would get a full consultation, then you will find out why you have never felt like you fit in. Over the years personality read from the eyes has been a haven and respite for those unusual one’s that walk this earth. If this is not the case and some of the classic interpretations of iris patterns just do not resonate with a client it is due to hemispheric shifting. That is moving in the long term from your left to right-brain or right to left-brain. Left-brain: analytical thought, logical and linear thinking including facts. Builds constriction and strength in the personality and body. Right-brain: creative thought, abstract, spontaneous feelings. Adds openness and need to explore. Open and expansive, right-brain energy makes the body thinner, more creative. Brain dominance plays major roles in how our personalities and bodies, express, adapt and cope with life experiences. 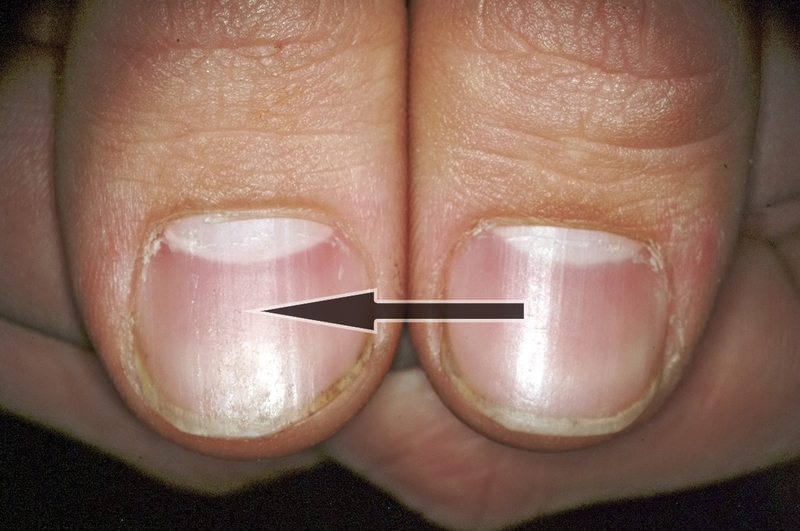 Hold your thumbs together and notice the half-moons at the base of your thumbnails, look just above the cuticle to see yours. The taller more pointed moon indicates the current more long-term hemisphere you occupy. Right thumb is left-brain, Left thumb is right-brain. Think of the left side of the body as feminine and the right side as masculine. 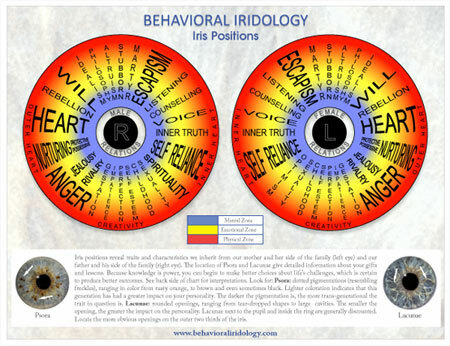 Now let’s explore iris positions and their specific effects on your personality and relationships. Iris Positions : Your specific gifts and lessons are identified by the structural components, (Psora and Lacunae), in your eyes. 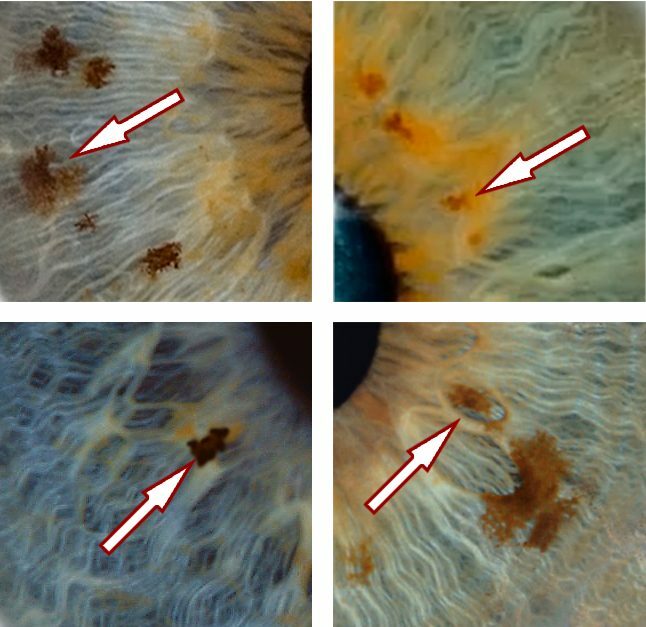 Psora and Lacunae identify specific traits and characteristics about you and your relationship between you and your father (right eye) and your mother (left eye). You can download the free iris positions chart to further clarify the understanding of your gifts and lessons. Iris Positions: In this section download or view the iris positions chart locate the Psora and Lacunae in your eyes and identify the position. On the back side is a short piece of the meanings and lessons of each position. For additional information, you can download Audio Files on Iris Positions a or get the booklet. 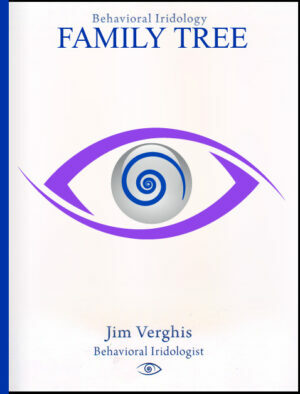 Iris positions are covered in both of Jim’s books. Wow, that was a lot and this just the beginning. 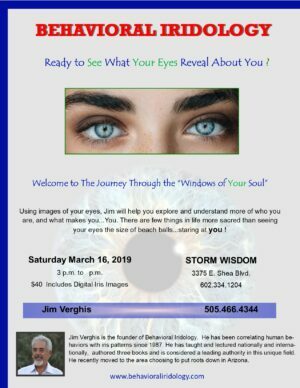 For those wanting to learn Behavioral Iridology for use in your everyday life or professional career, focus first on learning the overall meaning of the two primary personality types and iris positions. 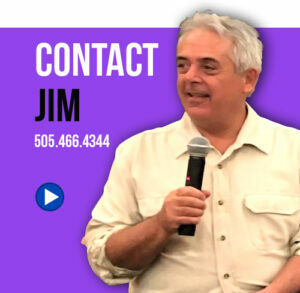 You will quickly be able to use this work to know your clients, family or friends at a new level of personal recognition and appreciation for what makes them be the way they are.